We had the opportunity to attend a game of European Handball in the German town of Baudsen. My friend’s first cousin (once-removed) plays on a men’s team there, but is currently out of action after knee surgery required to repair a handball injury. He and his family continue to support the team and so they invited us to attend a match. I didn’t know what to expect. I had barely heard of European Handball. I did play something called that once in gym class in high school, but I was equally thinking that we might be going to watch American handball which is similar to squash but you hit the ball with your hand rather than a racquet. It turns out that we were there to see European Handball, also known as team handball or Olympic handball. It’s a team sport played in a gymnasium with 6 players plus a goal keeper per side. At either end of the playing area, which is about the size of a basketball court, the keepers guard their nets which are bigger than an ice hockey goal but smaller than a soccer net. The winning team is the one with the most goals after two 30 minute periods of play. The game is fast, dynamic, and extremely physical, played by tall, big guys who can take a pounding. I would describe it as a cross between basketball, soccer, and lacrosse (but without the latter’s sticks or padding). The game is played with a ball approximately 20 centimeters in diameter, which looks like a small volleyball. It is covered with a slightly sticky resin to improve the grip, making it look dirty as it collects sweat and grime with use. The teams run back and forth down the court, trying to get free of their defenders. Fast breaks are common. Players can hold the ball for 3 seconds before passing, dribbling, or shooting. After receiving the ball, they can take up to 3 steps without dribbling, and three more if they dribble. Once they stop dribbling, they may take a further 3 steps and then have 3 seconds to pass or shoot. if that sounds complicated, it looks much simpler in practice. Like in basketball, dribbling is kept to a minimum anyhow because passing is much quicker. The real action happens at the 6 meter line, which extends in a semi-circle around the goal like the 3-point line in basketball. Neither defenders nor attackers are allowed to enter this zone. The offensive team wants to get as close to this line as possible and have a player in position and undefended to shoot on the opponent’s net. Like in basketball, they try to do this with a mix of rapid passing and quick changes of direction. To get as close as possible, more often than not, the shooter runs head long into the defenders and leaps into the air to shoot, often with disastrous consequences. More than once we saw a shooter slammed down to the gym floor on his back by the defenders. We watched in a gym that had about 1 meter of space around the perimeter — so close that you could smell the action while simultaneously facing the very real threat of getting a ball in the face or a player in our laps. 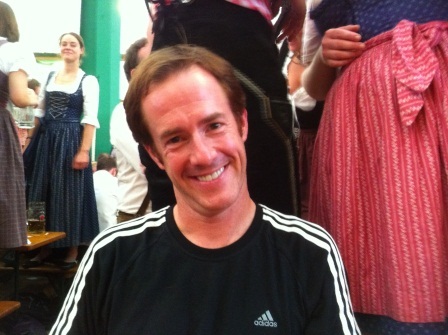 In typical German fashion, beer is sold in the school gym lobby to quench the throats of the screaming spectators, adding to the revelry. Excited by the action, I went out onto the floor at half time to give it a try. The ball felt familiar (I played basketball and volleyball in high school), but a bit sticky. I could hold and bounce it well enough. And so I ran up to the 6 meter line, leapt in the air, threw the ball into the net, and pulled my right groin. Apparently European Handball is a young man’s game. This entry was posted in Travel and tagged Bautzen, Europe, European Handball, Germany, Olympic handball, team handball, travel on November 14, 2011 by dreambigliveboldly. In the city of Bautzen in the Saxony region of Germany stands St. Peter’s Cathedral. It was built between 1456 and 1463, and had major restorations in 1634 after much of the town was destroyed by fire. What I find most intriguing about this church is that it is shared by Catholics and Protestants. Since 1530, the church has been home to two different congregations. 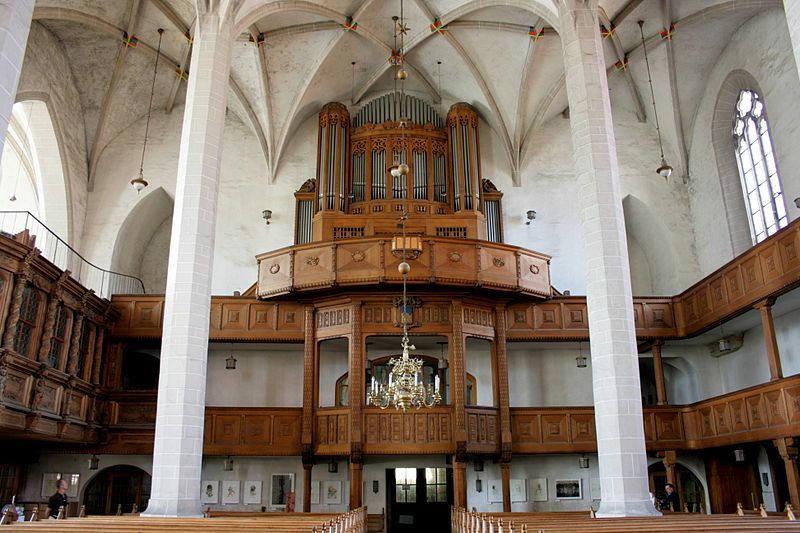 The church is divided into two halves, each of which has its own alter, pulpit, organ, and pews. The two organs are sonically matched to one another, allowing them to be played together. The separate hours of services are set by a contract made between the two groups in the year 1583 and which is still in effect today. 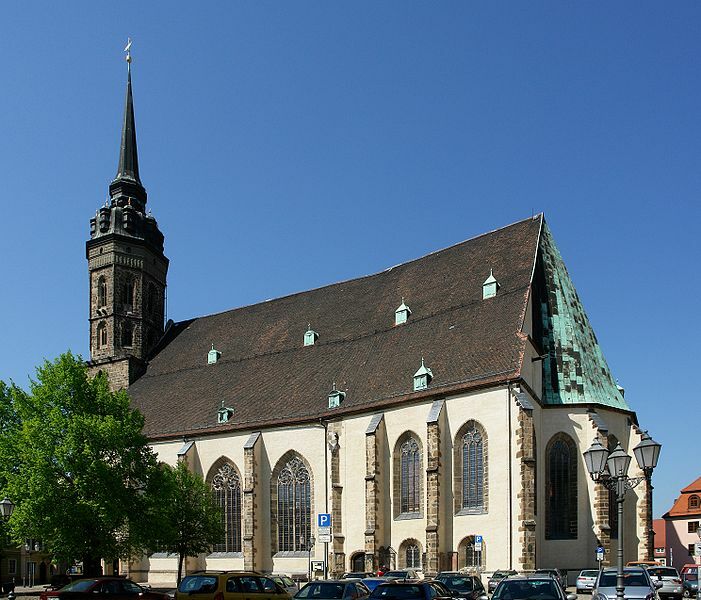 St. Peter’s is the oldest Catholic-Lutheran shared church in Germany. Shared churches are known as “Simultaneum”, where public worship is conducted by adherents of two or more religious groups. They became common in some parts of Europe in the wake of the Protestant Reformation. In Bautzen, an Evangelical Lutheran started preaching in the church in 1523, which eventually lead to the sharing of the church by two different congregations. This arrangement hasn’t been without some tension. There is a railing about 1 meter high between the two halves of the church. This railing is a diminutive replacement of its predecessor which was about 4 meters high (12 feet) and which was considered necessary in tenser times. The Catholics were expelled from the church for a short time in the Bohemian Uprising on 1620. I find it inspiring that in this town in the former East Germany, two different religious groups have been worshiping collaboratively in very close proximity for almost 500 years, while the same groups have clashed violently elsewhere (e.g. Northern Ireland). Apparently religious tolerance is possible and sustainable. I think they set a moving example for others to follow. This entry was posted in Europe, Travel and tagged Bautzen, Cathedral, Catholic, Dom, Dom St. Petri, Evangelical Lutheran, Germany, Lutheran, Simultaneum, St. Peter, St. Peter's Cathedral, Tuscany on October 31, 2011 by dreambigliveboldly. Welcome to the home of the $8 pretzel and beers big enough to sprain your wrist. 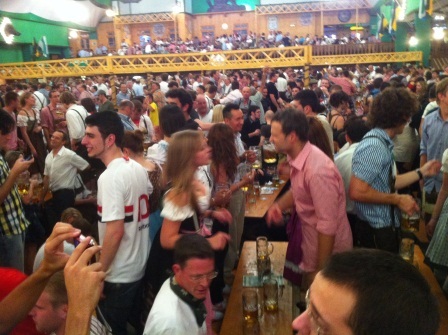 The ultimate getaway for the beer lover, Oktoberfest is a huge spectacle. It wasn’t what I had expected — it was better! Oktoberfest is a dynamic blend of beer gardens, dinner theatre, a costume party, and a carnival, all mixed together with a history of rich tradition. 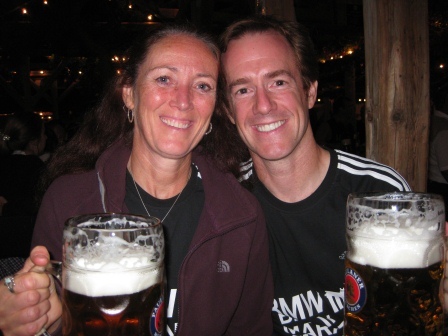 Oktoberfest began in 1810, when Crown Prince Ludwig was married to Princess Terese of Saxony-Hildburghausen. The people of Munich were invited to attend the festivities held on the fields in front of the city gates to celebrate the happy event. The fields have been named Theresienwiese (“Theresa’s meadow”) in honor of the Crown Princess ever since, although the locals have since abbreviated the name simply to “Wies’n”, a term that they also use to refer to Oktoberfest itself. The festival was eventually prolonged and moved ahead to September to take advantage of better weather conditions. Oktoberfest is a 16 to 18 day beer festival held annually in Munich, Bavaria, Germany running from late September to the first weekend in October. It the world’s largest fair and an important part of Bavarian culture, having been held since 1810 (202 times less 24 when it was canceled due to cholera epidemics, inflation, or war). Even better, starting this year, all beer tents were non-smoking. The Wies’n is a huge paved area (103 acres) located near Munich’s center and is filled with midway rides and food stands. On either side of the main thoroughfare are 14 large ‘tents’ (each the size of an ice hockey arena) and 20 smaller tents. 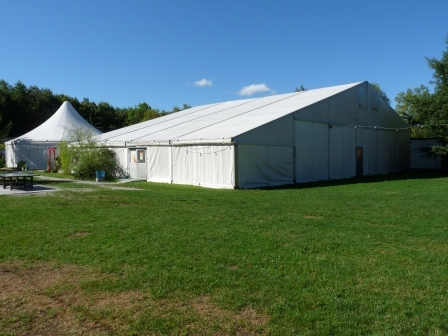 The tents, though impressive, are non-permanent structures which are constructed for and only used during the festival. Inside each of the tents are hundreds of tables jammed with thousands of people (including yours truly) drinking, eating, and singing their hearts out to the strains of live bands. Each of the tents has a unique flavour, with some more traditional and others more modern. In total there are approximately 100,000 seats for beer lovers to fill, and yet it’s still hard to get one. Each year over 6.5 million visitors attend Oktoberfest, drinking over 7 million litres of beer (someone must not be drinking their share because my table drank a lot more than that!) In support of this massive beer bash are over 1000 toilets and 900 meters of urinals. Many people, including a lot of tourists, sport traditional Bavarian clothes, lederhosen (leather pants) for the men and dirndl dresses for the women. During Oktoberfest (and even at other times of year) these traditional outfits can be seen being worn (and can be purchased) throughout Munich. 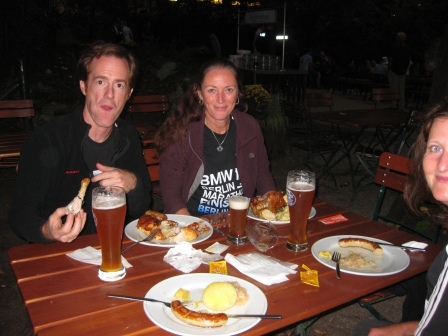 Only beer which is brewed within the city limits of Munich is allowed to be served at Oktoberfest. There are problems each year with young people who overestimate their ability to handle large amounts of brew. Many forget that Oktoberfest beer has 5.8 to 6.3% alcohol and a high sugar content (compared to an average of 5.2% alcohol and low sugar content in regular German beer), and they pass out. These drunk patrons are referred to as ‘Bierleichen’ (German for ‘beer corpses’). After an unsuccessful Oktoberfest foray the night before, where we were unable to secure a seat in the packed main tents and instead drank a beer in the outdoor seating of a small satellite tent where a stranger threw up under the table behind my friends, we were more prepared and committed for the next evening’s sortie. We arrived in mid-afternoon and established our position at one of the prized tables in the unreserved seating areas of a popular tent. It is necessary to maintain one’s station and defend it against the waitresses who attempt to pack more people onto their tables in an effort to inflate their revenues, and from latecomers who troll the rough wooden floors of the hall seeking a seat. It also requires significant stamina as our beer drinking began around 3 PM and continued unabated for over 7 hours! After an over-priced and unsatisfying meal of white sausage (Weisswurst) and sauerkraut shared with a friend, the band, seated on a large pedestal in the center of the tent, started playing the classic Oktoberfest tunes and a few new favorites. We stood on the benches more than we sat, pressing the flesh with the people on the tables behind us in a careful balancing act (kind of like an elevated mosh pit in lines). 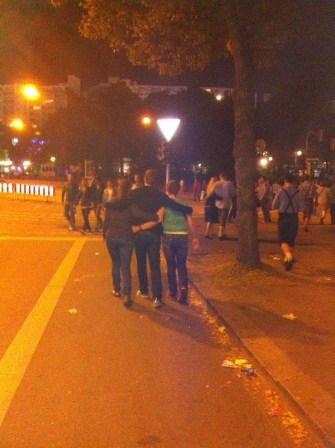 We belted out German songs we didn’t understand with people we didn’t know. For one night we relaxed and got silly with strangers. The shortest song and the one you hear most frequently is called “Ein Prosit”. The song ends with everyone standing and drinking. It is sung about every 15 minutes in order to keep the patrons well lubricated. The lyrics (translated to English) are “A toast, a toast, to the coziness of it all. Repeat. One, Two, Three – Drink Up!” Apparently it has more meaning in German, evoking feelings of social acceptance, belonging, being cheery and leaving your troubles at the door. We’d been warned by some people (German and others) that Oktoberfest was too touristy and that we’re more likely to be sitting with Japanese tourists than Germans. Although there were a lot of tourists, most of them were German tourists, and we had a good time. The whole event seemed very authentic, even more so after a couple of beers. 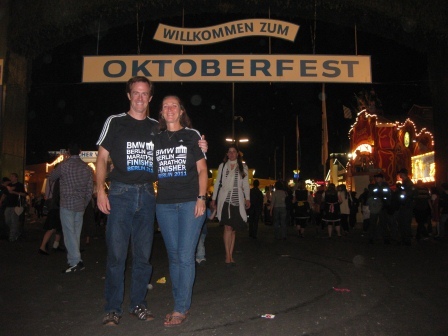 Patrick’s Note – Attending Oktoberfest was one of the things on my Dreams List (also known as a ‘bucket list’). With no idea how or when it might occur, I wrote it down several years ago and now it has happened. Dream Big! 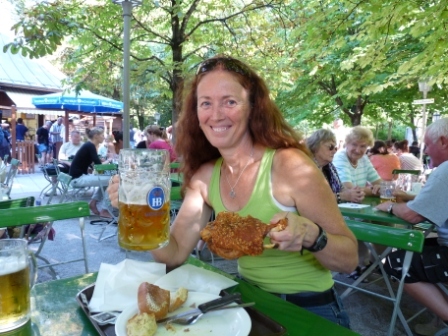 This entry was posted in Europe, Travel and tagged 2011, Beer, Bier, Germany, Munich, Oktoberfest, travel on October 22, 2011 by dreambigliveboldly. There are many memorials of war in Europe, monuments to its long and often violent history. Dachau is the site of a former Nazi concentration camp which we visited with some trepidation. It is located just 20 kilometers from the beer drinking revelry of Munich, but it is a very different and sobering experience. The camp is now a permanent memorial to what happened there. The perimeter fence, some guard towers and administrative buildings remain, as does the gas chamber/crematorium building. All the original prisoner barracks (except the one for special prisoners) have been demolished but their foundations remain and there is a replica barrack for visitors to view. Much of the camp is now open space, but there remains a sombre, eerie feeling to the place. We were strongly affected by what we saw and what we learned at Dachau, and subsequently at Buchenwald concentration camp, and the Memorial to the Murdered Jews of Europe in Berlin. Adolf Hitler was appointed Chancellor of German through entirely legal means on January, 30, 1933. Germany was at that time a democracy. Once the Nazis came to power they quickly moved to ruthlessly suppress all real or potential opposition. On February 27th the Reichstag (parliamentary building) was set on fire. It wasn’t proven definitively who did it, but it was blamed on an individual communist who was in the building at the time. Using fears of communism to justify his actions, within 24 hours Hitler suspended many of the German people’s basic rights (free speech, freedom of association, free press, etc.) He then quickly rounded up all of his political opponents and moved them to camps for re-education. Why did the German people stand for this? After World War I concluded with the Treaty of Versailles, Germany was required to pay onerous (some say impossible) reparations to the victors (mainly England and France). The German economy struggled and the German government printed more money eventually leading to hyper-inflation. The life savings of most Germans were wiped out. Unemployment was very high and the people were desperate for change. Hitler was a charismatic speaker and propagandist who billed his as the ‘party of action’. He identified scapegoats to blame for the problems (e.g. communists and Jews). He said that he would restore Germany to its former greatness. It was a message with appeal to distressed Germans. Hitler made no secret of his racist views. He believed that ‘Aryans’ (purportedly a master race of people of Northern European descent) were the superior race, that the Slavic peoples were inferior and should serve the Aryans, and that Jews, gypsies, homosexuals, and the disabled should be exterminated. Unfortunately, most people did not believe he would follow through with this, and chose instead to focus on the more appealing aspects of his message. 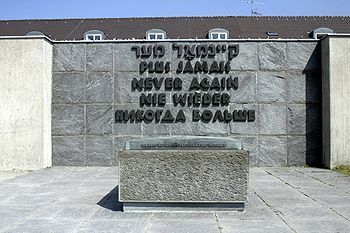 Dachau was the first Nazi concentration camp. It opened in March 1933 within 5 weeks of Hitler’s rise to power on the site of a closed ammunition factory. 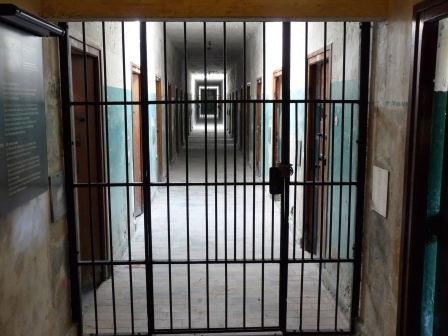 The camp was originally intended to holding German and Austrian political prisoners and Jews, but in 1935 it also began to hold ordinary criminals. In early 1937 the SS, using prisoner labor, initiated construction of a large complex of buildings on the grounds of the original camp. The construction was officially completed in mid-August 1938 after which the camp remained essentially unchanged. During the war it came to also include other nationalities including French, Poles, Yugoslavs, Czechs, Russians, and also a few captured Americans (because they had Jewish sounding names). 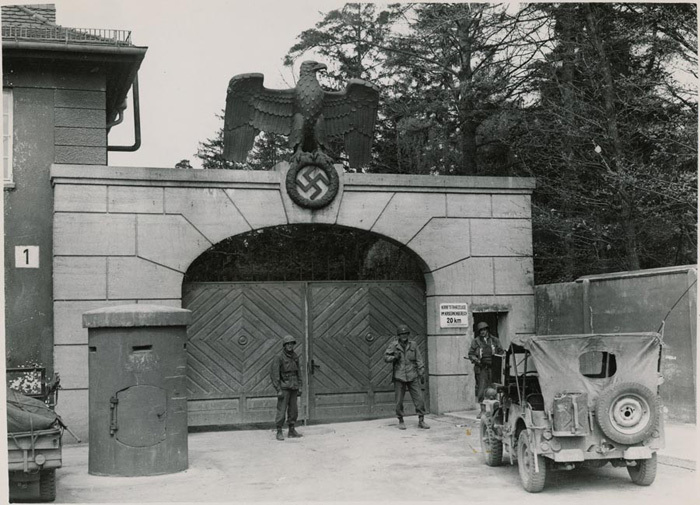 Dachau remained in operation until it was liberated by the Americans in 1945, and was thus the longest running concentration camp of the Third Reich. The name ‘concentration camp’ derives from the idea of concentrating the members of a group that is perceived to be undesirable in one place. The Nazis did not invent this concept. It had been used previously by the Americans, British, Cubans, and others. The term did not originally refer to the death camps of the Nazis, but it has since become synonymous with them. Dachau was branded a re-education camp, purportedly set up to re-educate people whose views were inconsistent with the Nazi philosophy. The principle means of ‘re-education’ were torture and abuse. The camp held primarily men and boys, but there were some women in subsidiary work camps. It had 69 barrack buildings with one reserved for special prisoners (well-known or influential people and clergy who opposed the Nazi regime — at least 3,000 Catholic priests, deacons, and bishops were kept there) and one reserved for unethical medical experiments on prisoners. Dachau was also one of what would eventually become 24 main distribution or registration camps. Prisoners were brought into the concentration camp system, catalogued, and redistributed to one of over 1200 subsidiary camps throughout Europe. Although many people were murdered here, it was not an extermination camp like Auschwitz, none of which were on German soil. A gas chamber was installed at Dachau (we walked through it reluctantly), but it was apparently never used. This camp was intended to be used for 20 years, after which time the Nazis believed that they would have long since conquered and stabilized Europe, and that no more re-education would be required. Prisoners did forced labour in the camp or at one of its 200 subsidiary camps, 90 of which could be reached by marching on foot. Those who could not work were murdered (or sent away to be murdered). 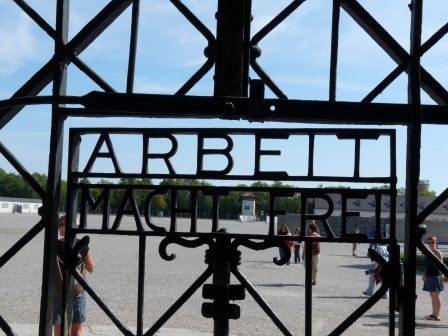 The main door of the camp still displays the words ‘Arbeit Macht Frei’ meaning ‘work will liberate’, but there was no relationship between one’s work at the camp and their chances of being set free. A small number of people were freed from Dachau, including some to celebrate Hitler’s birthday, on the condition that they never report what happened there. Prisoners arriving at Dachau were stripped of their belongings, identification, and very importantly for their captors, their names. Each was given a number and wore coloured badges to identify their groups (e.g. political prisoner, Jew, homosexual, criminal). They had no contract with relatives and were quickly lost in a system where they were moved to other camps without anyone knowing. 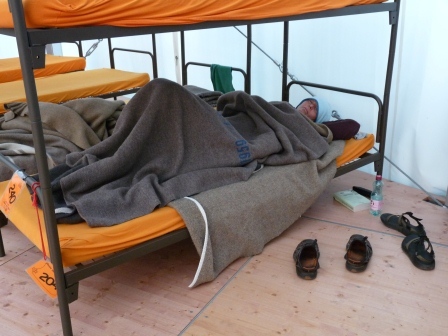 Conditions in the camp were atrocious. The camp was designed for 5000 people but held 37,000 when it was liberated. Barracks designed for 200 people held over 2000. There were not adequate or sufficient toilet facilities. Many people were sick with typhus and diarrhea. Windows were not allowed to be opened so air quality was poor. The food provided was the minimal to sustain life but of poor quality, and most of the good provisions originally intended for the prisoners were withheld by the hierarchy of guards and others who controlled the camp. Most prisoners lost half of their body weight within months of entering the camp, if they lived that long. These terrible conditions, in conjunction with the torture, abuse, and forced work resulted in the death of many people. Those who couldn’t handle it any longer committed suicide, often with the encouragement of the guards. Most commonly people committed suicide by running across the ‘death strip’ and into the wire surrounding the camp where they were shot. Twice a day all prisoners (living and dead) were assembled on the parade square to be counted. At the height of the epidemics, over 200 people were dying per day. There was a hierarchy of prisoners within the camp which was deliberately organized and manipulated by the guards. Prisoners from the various groups (political prisoners, criminals, homosexuals, gypsies, etc.) were mixed together in the barracks to divide and conquer, with those who helped control the other prisoners per their captors wishes receiving special treatment (e.g. cigarettes, alcohol, access to prostitutes). For the most part, the camp was run by the prisoners themselves. There were always people willing to do the dirty jobs, including torturing and even murdering other prisoners, in return for special treatment and perhaps the hope that by currying the guards favour they might survive. At the height of the epidemics in the camp, the guards would not even enter it, and yet the camp continued to function normally, run by the prisoners themselves. I find this to be frightening example of how people, when faced with the breakdown of society, will act to save and benefit themselves even at the direct expense of others. How quickly we can revert to survival of the fittest. Dachau became the prototype for all other concentration camps. All the Commandants of other concentration camps started here. 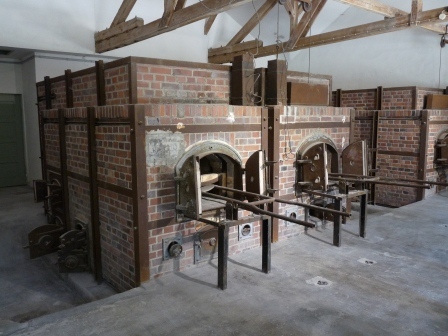 Dachau was known as the ‘School of Violence’. where the techniques of containment, forced labour, abuse, and murder were refined. In the final months of the war, the conditions at Dachau became even worse. As Allied forces advanced toward Germany, the Germans began to move prisoners from concentration camps nearer the front to more centrally located camps. By doing so they hoped to prevent the liberation of large numbers of prisoners. Transports from the evacuated camps arrived continuously at Dachau. After days of travel with little or no food or water, the prisoners arrived weak and exhausted, often dead or near death. 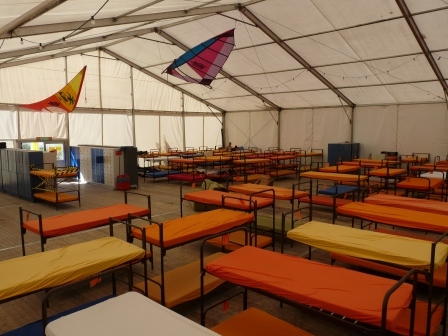 The camp was constantly overcrowded and the hygiene conditions were beneath human dignity. Due to the immaculate record keeping of the Germans, we know that 206,000 prisoners went through Dachau concentration camp. Of these approximately 40,000 people died here or in the subsidiary work camps, mainly from disease, malnutrition, and suicide. The Dachau Concentration Camp was liberated by the 45th Infantry Division of the United States Seventh Army on April 29, 1945. The camp Commandant had fled two days before so two SS troopers officially surrendered the camp to the Americans, facilitated by a representative of the Red Cross. The American soldiers, already hardened by war, were not prepared for what they found. Outside the camp were 30 box cars full of dead bodies in advanced stages of decomposition. 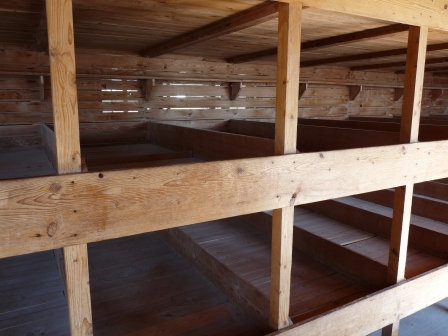 More bodies were found around the camp and piled high in rooms adjacent to the gas chambers and crematorium. The surviving prisoners were gaunt and sick. Seeing this, some American soldiers killed an estimated 25 to 50 of the German guards. These soldiers were later court-martialed but subsequently pardoned by General George S. Patton. After liberation, the prisoners were forced to remain in the camp for a period of time for fear of them spreading disease among the general population. Most of them had no money, homes, or families to return to. Despite improved treatment, food, and sanitation, people continued to die in the camp at the rate of 50 to 80 per day. Despite the many atrocities, some people did survive Dachau. Although thousands survived as a result of liberation or the rare release or escape, there are no records of the names of the survivors. Only 200 of them are known. Each year, on April 20th, those who can face their painful memories are welcomed to return to Dachau. There they can share with fellow survivors, remember those who died, and they also receive free health care from the German government. Germany is very open and honest about this dark period of its history. All school children are required to learn of this and most visit concentration camps on field trips. There were several groups of teenagers there the day we visited. I wondered what they thought. How would I feel if my country or perhaps my grandparents had been part of something like this? Note from Patrick – This posting took me a very long time to write, and not just due to the detail required. I started and stopped many times thinking about what I was writing and why I was writing it. For some reason, having learned this information, I thought it was important to share it. Perhaps it is my small contribution to helping make sure that this never happens again. This entry was posted in Europe, Travel and tagged Concentration Camp, Dachau, Germany, Jew, Nazi, travel on October 22, 2011 by dreambigliveboldly. The monks of Bavaria are the traditional brewers of beer here, with secret recipes being handed down for hundreds of years. They still own some of the breweries and beer halls today. The first beer hall we visited was Augustiner Brau in Salzburg, Austria (not technically Bavaria, but close by). It has 4 huge rooms, one of which is non-smoking, which seat up to 2800 people in total. This beer house was founded by the Augustinian monks, and the image of Jesus adorns each room (perhaps they’re hoping to keep intoxicated visitors on their best behaviour). Beer is poured directly from large casks to thirsty patrons waiting in line with empty crockery steins. 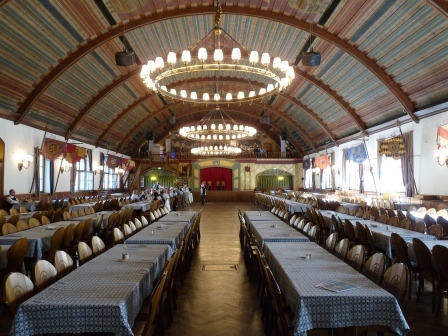 Bavaria, in the southern part of Germany, has a plethora of beer halls (known as “Brauhaus”). Many of these are hundreds of years old with rich histories. The most famous of Bavarian beer halls is the Hofbräuhaus in Munich. Founded by the Duke of Bavaria, Wilhelm V, they have been serving beer there since 1589 (that’s 423 years of continuous beer drinking!) In the early days, it was a place for men only. It is doubtful that women would have wanted to participate anyhow due to the cursing and the fighting and the vomiting. Also, the tables had troughs underneath so the guys could urinate without leaving their seat, allowing a near continuous flow of beer in and out. Another example of German ingenuity and practicality. In the early 20th Century the upper floor of the Hofbräuhaus was also the meeting place of the fledgling Nazi party, and on February 24, 1920, Adolf Hitler proclaimed the twenty-five theses of the National Socialist program at the Hofbräuhaus, which reconstituted the German Workers’ Party as the National Socialist German Workers’ Party, also known as the Nazi Party. Today the Hofbräuhaus is primarily filled with tourists drinking expensive beer in large steins. 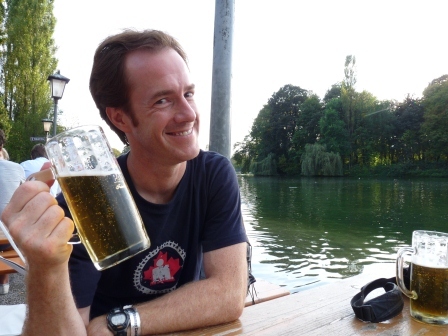 Munich is home to the largest beer gardens I’ve ever seen. Every park seems to have one or more. Beer gardens of up to 7000 people are commonplace. In order to be an official beer garden, three things are required — it must serve beer, it must be in Bavaria, and it must have chestnut trees. Bier gardens were traditionally located on top of the underground cellars where the beer kegs were stored. People drank beer there because that’s where the beer was! The casks were winched up from below, tapped on the spot, and people stood around drinking beer setting their glasses on the beer kegs (it was only later that tables and chairs were added). Why chestnut trees you ask? Chestnut trees have broad leaves and shallow roots and were planted on top of the underground beer cellars to keep them cool in summer. The disadvantage of Chestnut trees is that they randomly release hazardous projectiles each year around this time. Diane was hit on the hand in our first week here resulting in a bruise. And one night in Munich she sustained a direct hit into her beer glass which exploded sending shards of glass into our meals. Notice how Diane’s glass is half the height of the others. A nice thing about beer gardens (other than the beer of course) is that you’re allowed to bring your own food. This is done to appease the local merchants who know that the beer gardens attract so many people that to restrict outside food would affect their sales. Presumably the beer gardens are making lots of money from the beer anyhow. 500 ml and 1 Litre sell for about $5 and $10 respectively with no price advantage for buying the larger size. The Bavarian Purity Law of 1516 (the Reinheitsgebot) allowed beer made in Bavaria to contain only 3 things — water, barley, and hops. German breweries continue to adhere to a slightly expanded version of this law today (wheat can now be used and a couple of additional ingredients are allowed depending on the type of beer being brewed). This law was originally put in place to prevent price competition between bakeries and brewers for wheat. The restriction of beer grains to barley was meant to ensure sufficient supply of wheat for baking bread. Hops adds flavour to beer but also acts as a natural preservative, and it was required by the Purity Law to prevent other inferior types of problematic preservatives from being used (for example soot or stinging nettles). Those of you with a science or brewing background may notice that a critical component of beer is missing. That’s because it was not until the 1800’s that Louis Pasteur discovered the role of microorganisms in fermentation, so it was not known that YEAST was a required ingredient of beer. However brewers traditionally added some sediment into each batch from the previous fermentation which provided the necessary organisms. If this was not available they would put the beer in multiple vats allowing natural yeast to inoculate the brew. The undisputed champion of beer drinking locales is the city of Munich which, in addition to Oktoberfest, has beer festivals for over 30 weeks each year. The current pope, in addition to re-distributing child abusers, was Cardinal in Munich in the 1990’s and was known to drink beer with the locals. Because the tables are usually full, we’ve found the beer halls to be an excellent place to talk with the local people. 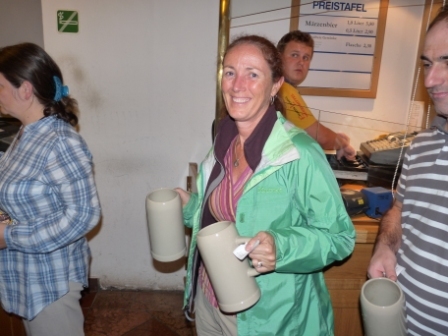 What better way to interact with the locals than over a big stein of beer! 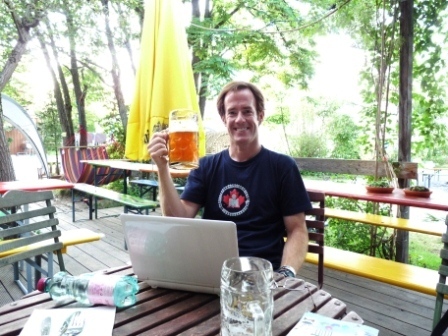 This entry was posted in Europe, Travel and tagged Bavaria, Beer, Beer Gardens, Beer Garten, Beer Halls, Beer Haus, Germany, travel on October 12, 2011 by dreambigliveboldly. 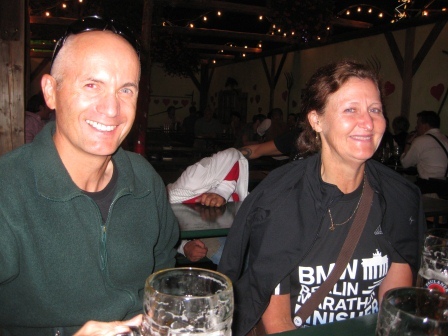 Elisabeth was born in Hungary but moved to Germany when she was 4 years old. At the age of 14 she married Ludwig, a wealthy and powerful man. Despite this, she lived a simple life and spent her time helping the poor and the sick. She donated a lot of money to good causes, including the establishment of several hospitals. One of these hospitals was built nearby her home, and she would volunteer her time there including doing the dirtiest of jobs. 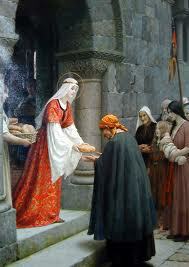 Against her husband’s wishes, Elisabeth often took bread to give to the poor of the nearby village. One day her husband came across her carrying what he assumed was a basket of bread. He asked her what was in the basket and she replied, “roses”. When she opened the basket, the bread was indeed roses. Her husband, a religious man, took this as a sign of God’s approval of her good deeds. Elisabeth’s husband died on a trip to Itaiy. She moved with her three children into a convent and spent the rest of her days there helping the sick and the poor until she died — at the age of 24. Elisabeth was born on July 7th in the year 1207. Her full name was in German was Heilige Elisabeth von Thüringen. She was the daughter of Andrew II of Hungary and Gertrude of Merania, and at age four was brought to the court of the rulers of Thuringia in central Germany, to become a future bride who would reinforce political alliances between the families. In 1121 at the age of 14, she married Ludwig, the same year he was crowned Ludwig IV, and the marriage was by all accounts a happy one. She lived in Wartburg Castle (which we visited yesterday) above the present-day town of Eisenach. She and her husband were devout Catholics and she patterned her life after Francis of Assisi, whom she learned about from Franciscan monks. Her husband died of plague in Otranto, Italy on his way to the Sixth Crusade and his remains were returned to her the following year. She moved with her children into a convent where she continued to help the sick and the poor until she died at the age of 24 on November 17, 1231. Elisabeth is today known as St. Elisabeth after being canonized by Pope Gregory IX in 1235. What struck me about this story is that a teenager, despite having money and power and in addition to having 3 children, would devote her life to helping the poor and sick. This was very unusual in her day as it is today. And how sad it was that she only lived to age 24. This entry was posted in Europe, Travel and tagged Elisabeth, Germany, St. Elisabeth, travel on September 29, 2011 by dreambigliveboldly. 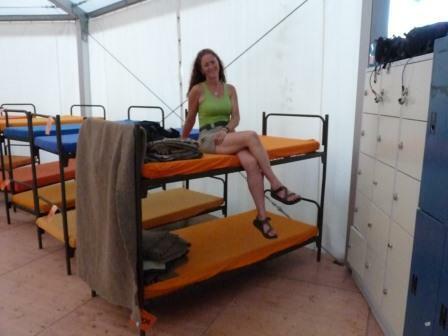 This entry was posted in Travel and tagged accomodations, Europe, Germany, hostel, Munich, Oktoberfest, The Tent, travel on September 19, 2011 by dreambigliveboldly.